While Fallout 76 wasn’t part of the QuakeCon 2018 keynote, a whole panel was dedicated to the upcoming online game by Bethesda Game Studios. The presentation (available now on YouTube) focused first and foremost on revealing the revamped character progression system (S.P.E.C.I.A.L., also known as Strength, Perception, Endurance, Charisma, Intelligence, Agility and Luck). Each time you level up (until level 50, at least), you’ll receive a S.P.E.C.I.A.L. point that can be allocated in either of the aforementioned stats (the cap for each stat is 15). You’ll also select a perk card to go with that point, and as you accrue more points in a specific stat you can then add more perk cards. There’s also another option, though, and that’s to improve the existing perk card you got from level one up to level five, which in turn increases its point cost accordingly. To make it short, player characters with ten points in Strength can then select ten level one perk cards or five level two perk cards, as a straightforward example. Interestingly, perk cards can be adjusted as needed on the fly which means that your character’s setup can change as much as desired. Card packs will be provided every two levels up to level 10, and every five levels afterward. Overall there’ll be hundreds of perk cards to suit many different play styles. Below you can find a gallery of those that were showcased during the panel. 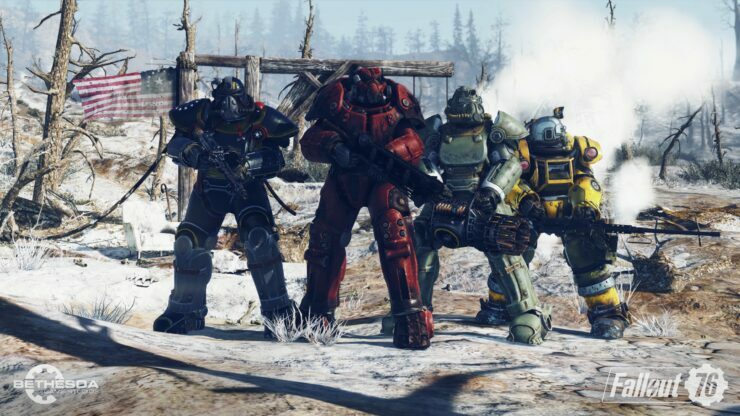 Todd Howard also addressed in greater detail some of the concerns regarding Fallout 76 PvP and the potential for griefing. Shooting another player at first doesn’t deliver full damage, as Howard likened it to slapping someone. If the other player fires back, though, then both players will now inflict full damage to each other. If the other player doesn’t fire back, even the limited damage done by the aggressor can eventually kill him. That would turn the aggressor into a wanted murderer, though, while yielding no loot benefits. On the other hand, a wanted murderer gets a bounty placed on his/her head and everyone currently online on the server can view that player’s location on the map. Furthermore, if killed the murderer will lose caps out of his/her own supply to whoever brought them to justice. Dying to another player in general also means you’ll lose some “junk”, which is used in the game to craft and build. This will ensure there’s an element of risk versus reward to venturing out in the wild. To secure your junk, there are many stashes scattered throughout the map. On the anti-grief topic, Howard revealed an ignore option that makes it so a certain player who already killed your character cannot keep doing that, as it won’t be able to see your character on the map anymore. Due to the world size, it becomes then highly unlikely you’d run into that player killer again in the session. The developers are also working on a ‘pacifist flag’ of sorts whose purpose will be to disable outgoing PvP damage. This is meant to prevent griefers who purposefully put themselves in front of the crossfire in order to be able to kill with impunity. Lastly, Fallout 76 will feature proximity based global voice chat to help communication between players. Of course, there’s an option to mute it. Fallout 76 will get a beta in October ahead of the November 14th launch on PC, PlayStation 4 and Xbox One. Stay tuned on Wccftech for more on this highly anticipated game.